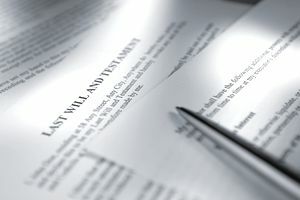 Estate Planning: What is a Last Will and Testament? A last will and testament is the most important building block to any estate plan. It should explain and clarify the details of what you want to happen with your property and other issues at the time of your death, but the extent to which it does so depends a great deal on the type of estate plan you've elected to put into place. Is it a will-based plan or a trust-based plan? Your last will and testament will take on a significantly different role depending on the type of plan you choose. Your will provides all the essential and necessary details of who will inherit your property with this type of estate plan. It will explain when and how they will inherit, and it should name your choice of an executor, sometimes called a personal representative. This is the individual who will be put in charge of settling your final affairs and guiding your estate through the probate process. Your will should cover these four important points. It should also state what powers you want your executive to have, as well as address a fifth important point if you have minor children. Who will serve as their guardian until they become adults if their other parent predeceases you or dies with you in a common event? If you form a revocable living trust, it will cover the same four basic provisions that a will covers, but the person in charge of settling your final affairs will be called your administrative or successor trustee rather than the executor or personal representative. Your trust formation documents will address the assets you've funded into your trust, but you'll still need a last will and testament to be on the safe side. You must transfer ownership of your assets into your trust's name before you die so your trust agreement can deal with them. If you fail to fund even one asset into your trust, a will becomes necessary to "catch" that unfunded property and transfer it into your trust when you die. This type of will is called a "pour-over will." It will provide for any unfunded assets to pour over into your trust after your death through the probate process. Then the provisions of your trust will determine what beneficiaries get this property, too, as well as how and when they receive it. Pour-over wills cover only two points. Who will be in charge of your assets that were not funded into your trust and what powers will she have in this regard? This would typically be the executor or personal representative named in your pour-over will. As with a regular will, a pour-over will can also name a guardian for your minor children if you have any. Your trust documents can't achieve this. The state you live in at the time of your death, as well as any other state where you own real estate at the time of your death, will effectively provide a will for you according to the state's intestacy laws if you fail to make a will before you die. These laws vary from state to state, and they can cause different people to inherit your property if you own real estate in more than one state. The only way to ensure that your property will go the beneficiaries that you choose is to leave a valid will. Your spouse's inheritance from you could be limited to as little as 50 percent of your estate otherwise. And you would have no say in who raises your children after you're gone. A probate court judge will appoint a guardian for them if you don't make your wishes known. In either case, whether your will is a simple pour-over will or much more complicated, it must meet your state's laws and rules for a valid will or the probate court won't honor it. The result, in this case, would be the same as if you had not left a will at all. These rules can govern some seemingly minor things that are nonetheless very important, such as how many witnesses you must have to the signing and exactly how you should sign. In fact, most "invalid" wills are declared so for errors in these areas. An invalid will won't just eradicate a specific term or bequest. The entire last will and testament and all its provisions will be thrown out. It's a good reason to always have your will reviewed by an attorney if you write one yourself, or to have an attorney draw up your will in the first place.